Two weekends ago, we converted Eva’s crib into a toddler bed. This makes me so sad beyond words. I thought we had a couple more months until this happened. Heck, maybe even another year. I have a couple of friends whose kids didn’t transition into a toddler bed until they were 20 months (okay, Eva’s a month shy of that) to 2+ years old. (I know, don’t compare.) My baby girl is growing up. Time just needs to slow down. The hubs and I went to sleep late one Friday night as we were watching Prisoners at home. (Side note: I knew well beforehand I’d freak out with a movie where the plotline was about a kid getting snatched. After watching it I’m now even more paranoid about it. I can’t watch these types of movies anymore. SVU isn’t as entertaining as it once was now that we have Eva. All the different scenarios make me sick to my stomach and makes the mama bear in me so frightened and protective). I woke up 3 hours later with a smiling Eva standing at my bedside, tapping me, and saying “Mama. Mama. Mom.” I thought I was dreaming at first. As I was trying to figure out why she was at my bedside, she continued to stand there, smiling at me and waving hi. 😀 (She is too freaking adorable.) I tapped the hubs and asked if he took her out of crib because she was crying. He said no and was as stunned as I was when he saw her standing by my side of the bed. I immediately thought he was pulling my leg. Surely, she couldn’t have gotten out of her crib? If it wasn’t him, was there someone in my home? (STUPID MOVIE) But alas, no one was there. I’m convinced he was sleepwalking. We go back to sleep saying we’ll figure it out in the morning. We looked at her room the next morning and came to the notion she stepped on her pillow, pulled herself onto the box next to her bed (we’re still unpacking) onto a pile of clothes and onto the floor. Still seemed weird though. I was still convinced that he was sleepwalking (Sorry hubs!). In the afternoon, it was time to put Eva down for a nap. I put her in her crib and walked away. With the thought of “she’s in her crib she’s not going anywhere,” I stupidly didn’t close the stair gates. As I’m in my bathroom washing my face I hear the stair gates slam. I ran over to the stairs. Lo and behold Miss Eva swinging the gate open and shut. I’m immediately stumped and freaked out. 1) NO WAY YOU GOT OUT OF THE CRIB. 2) HOW?!? 3) STUPID ME, WHY DIDN’T YOU CLOSE THE GATE? THAT COULD’VE BEEN SO DANGEROUS! 4) NO WAY!!! 5) HOW?!? 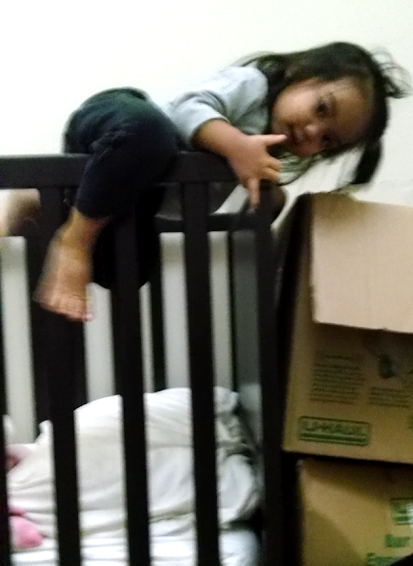 I put her back into the crib and tried to get her to nap. She climbed out again, which is when I recorded it. For the purposes of this post, I’m just going to post stills of the video I took. I don’t want to freak anyone out. I, myself, was freaking out as I was watching her do this again. Getting in start position. I didn’t even know she could stretch her leg up that high! “I’m coming to you.” Up and over. NO FREAKING WAY. SERIOUSLY, CHILD? 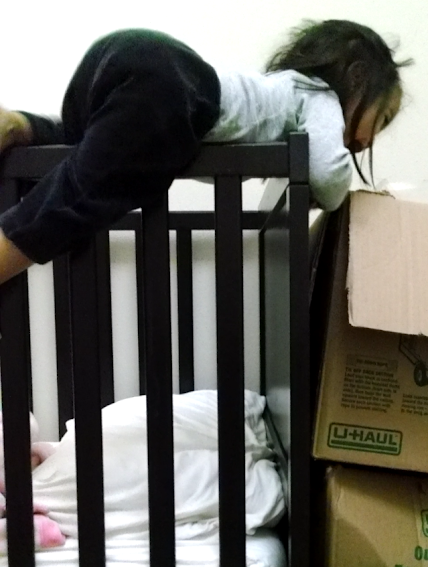 To avoid any future accidents the hubs took down the railing and converted her bed to a toddler one. 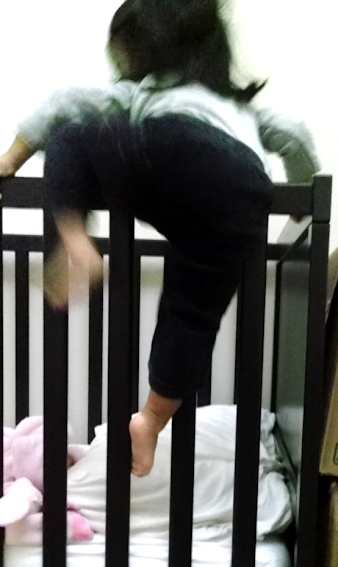 Her crib toddler bed (it was a convertible crib) is a foot off the ground but somehow she managed to fall off the first night. So we’re looking into getting a bed railing. Right now, we’re using a body pillow next to her to keep her from falling and a futon on the floor next to the bed as a second safeguard. It’s been a challenging two weeks since this happened. She knows she can get out of her bed now, so at bed time she walks out as soon as we put her down. We’ve tried to walk her back into the room and put her down, which works for the first 2 minutes and then full on crying, kicking and screaming. So we’ve been laying on the floor next to her bed until she falls asleep. We did this a handful of times when she was in her crib, but not this much. 😦 We started moving away from the foot of her bed to the middle of the room to now the door. But she always sits up to make sure we’re there. So I don’t think we can put her in her bed and walk out of her room just yet. I miss those days. I could spent the extra 30 minutes to an hour prepping everyone’s lunches (family meal prep post coming up soon!). Oh well! My time is now her and the hubs’ time. So I’ll stay up an extra hour. Anything for those two! It’s the same bed, but she is NOT happy with it. I don’t think it’s her “new” (we’ve been at our new place for a month) room because she was sleeping perfectly fine in there when it was a crib. I’ve been racking my brain for solutions to love her bed again. She has her lovie blanket and Sofia cuddle doll in her bed with her. I’ve even taken out the new Minnie blanket she received for Christmas as a way to try to entice her that her bed is cool! When she goes down, she’s pretty good. Half the time she’ll wake up at 4 in the morning and cry (bad try and/or teething. she has some bottom teeth coming in) or come into our room. I’m running out of ideas. I need to stop forcing it and just go with her flow. We’ll all figure it out when we (hubs and I) least suspect it. Mommies, daddies, caregivers, or teachers, any tips? Awwwww! Such a bittersweet time! She’s such a cutie! I’m glad she’s growing up, but it’s always sad to say good-bye to the sweet baby times.